© George Wellman: Reproduced with permission of the copyright owner. Further reproduction prohibited without permission. The story of this woodie really starts in Leavenworth Penitentiary with a man named Charles Allen Ward. Ward was born in Seattle and his early life was amazing but unsettled. At one point, he joined up with Pancho Villa after President Diaz of Mexico was overthrown. Ward recognized a business opportunity when he saw that soldiers were killing cattle. With permission from Villa to harvest the hides, Ward sold them in El Paso. He left Villa’s army and moved to El Paso with $70,000 where he gambled and drank until the money was gone. Following a move to Denver, he lived a much less prosperous life as a bouncer. Federal narcotics agents had suspected him of drug dealing for a couple of years but had insufficient evidence to get a conviction. He was arrested and convicted on lesser narcotics charges and sent to Leavenworth. Initially, believing he was convicted on falsified charges, he was a bitter man who vowed that no prison could hold him. Later, he had a change of heart and resolved to change his life and make the most of his prison stay. He became a model prisoner, a “trustie,” and got a job in the prison power plant. He gained electrical knowledge and later became superintendent of the power plant. In this role, he gained experience in management and effectively and sympathetically supervised 150 men. In Leavenworth he met Herbert H. Bigelow from St. Paul, MN. Bigelow was Chairman of the Board of Brown and Bigelow, a greeting card company formed in 1896. The Federal Income Tax had just been implemented and Bigelow chose not to pay it. Perhaps to make an example, he was convicted and sent to Leavenworth. Bigelow, an executive, was not well suited to rough prison life. Ward, who was both tough and well liked, intervened on his behalf and served as a buffer between Bigelow and the other prisoners. By helping Bigelow run his company from the prison, Ward also learned about Bigelow’s company. A grateful Bigelow was released in 1925 and promised Ward a job at Brown and Bigelow when he was released. Ward did get released a few weeks later and made his way to St. Paul. Bigelow met him at the station and Ward soon started his job as low-paid laborer. This was not exactly what Ward had in mind, but he rapidly rose through the ranks of the company and was the Vice President by 1933. The South Bend Tribune reported on September 21, 1933 that the 63-year-old Bigelow died in a fishing accident in northern Minnesota along with at least two others. Ward was already a wealthy man when he discovered that Bigelow had left him $1,000,000 and a 200-acre farm in Wisconsin. 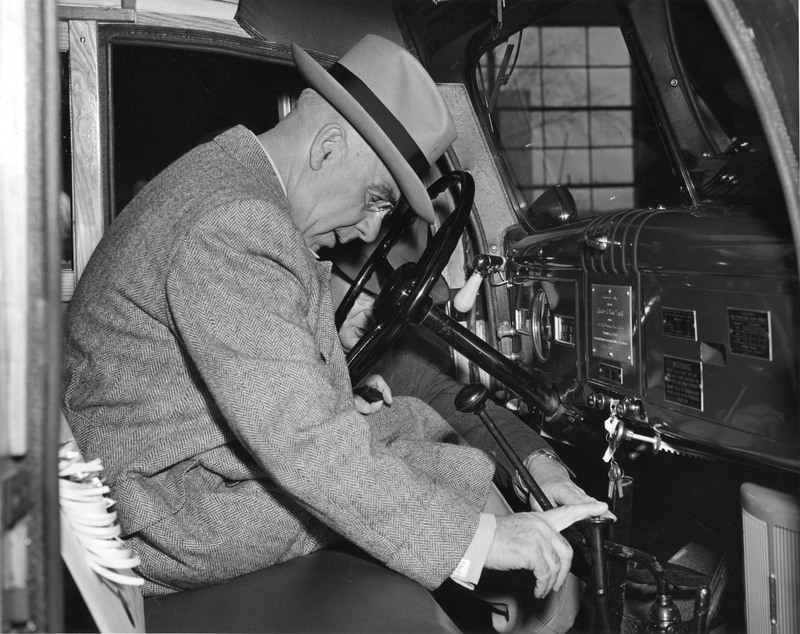 Ward was appointed President of the company by the Board of Directors and served in this position until his death in 1959. Ward also owned two large ranches in Arizona. 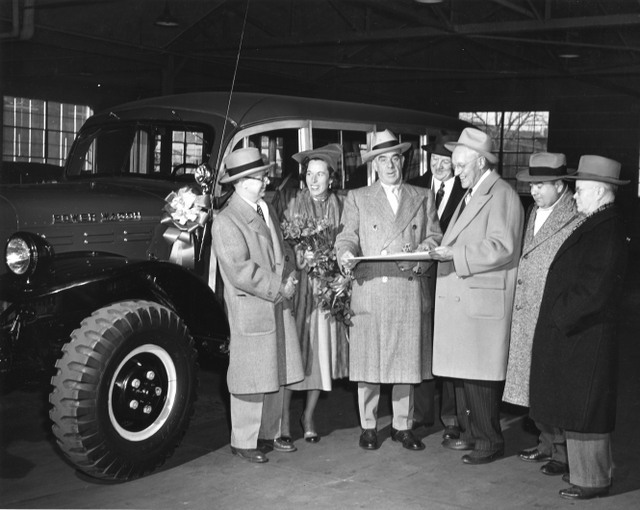 Employees presented the Power Wagon Woodie to Charles Ward and wife for Christmas in 1949. After Ward’s death, his widow lived on Rancho Roca Roja near Cottonwood, AZ. The truck had arrived on that ranch by 1951 and was still there when Ward’s widow decided to sell it in 1969. She sold the truck to the Fire Chief of Yavapai. He added a siren, painted the exterior of the cab red and named the truck Tania. But Power Wagons were not built for speed, and he soon found that the truck did not make a very suitable Fire Chief’s car. Gomer Jones, a Chrysler dealer and MoPar collector in Prescott, AZ bought the Power Wagon from him in 1974. And that is where I found Tania in 1994. Woodie as purchased by George Wellman. Rick Sultan photo. I had become very interested in Power Wagons. I attended a Power Wagon rally in Fairfield Iowa in 1994 hoping to buy one of these legendary 4-wheel drive Dodge trucks. I met Jack Garner there and he told me about two Power Wagons for sale in Arizona, one of them a woodie; I immediately made plans to go there. I lived in the Philadelphia area at the time. Shortly after I returned from the rally, I made arrangements to visit the trucks over a weekend. I flew into Phoenix, rented a car and drove out to see the first truck. After agreeing on a price with the owner, I now owned my first Power Wagon, a beautiful red pickup. But it was still Saturday and I was not going back home until Sunday. So I thought I might as well drive to Prescott and see the other truck. I walked into the Jones garage and saw a big collection of Chrysler products, mostly muscle cars from the 70s. But in the back, I saw the familiar grill of a classic Dodge Power Wagon, this one with a woodie body! It looked to be remarkably well preserved save for some damage to the wood. 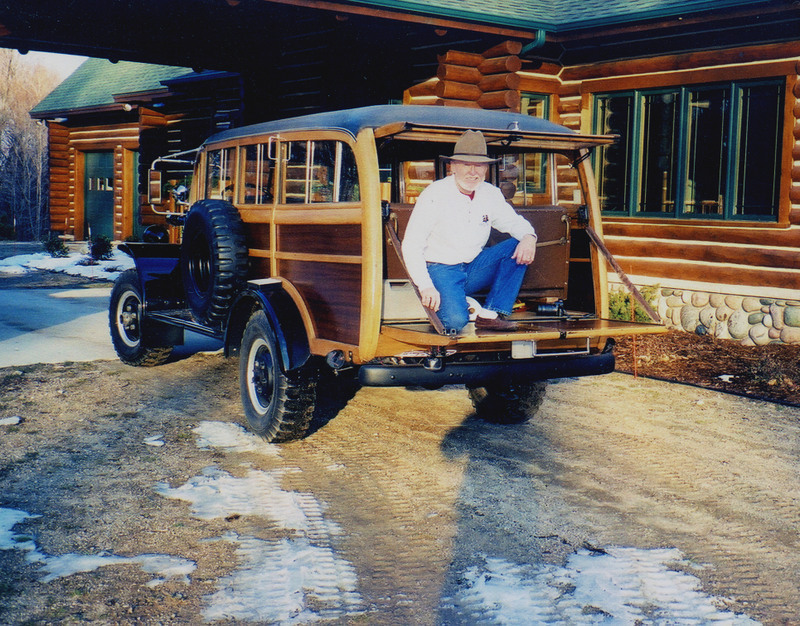 I knew then that I not only loved Power Wagons, I loved woodies too! I had to have that truck. The asking price seemed high for a Power Wagon, but recall that I was not very knowledgeable about woodies. Having just bought another Power Wagon in the morning, buying a second within hours seemed a bit much. Still I made an offer. Jones told me another person was coming to see it and he had talked about a higher offer. I asked him to call me if that did not go through. In hindsight, I should have immediately agreed to the asking price; it was in fact, fair. And I came close to not getting it. A month later, I got a call from Arizona. My offer was accepted. I made arrangements to get both trucks shipped east. The first truck was shipped to my house in Philadelphia; the woodie was shipped to my brother’s place near Lansing, Michigan. When I got a chance to look it over more closely, I realized that the wood did need to be refinished and a couple repairs were necessary. Kids had apparently walked on the roof and had broken the center spine. A hole had also been punched through one of the panels. While there was no rot thanks to the Arizona weather, the varnish was peeling in places and dull elsewhere. I mentioned I almost did not get the truck. Sometime after I got the truck back to Lansing, I got a remarkable phone call from California. It was from Tom Philippbar who had learned that the truck had been sold to me about an hour before he had decided to close the deal with Jones. Not being able to get the truck he wanted, he set about building one. I provided pictures of mine and he had the exceptional technical skill and capability to build a superb fire truck woodie. If I thought that call was remarkable, a later one was even more so. For a couple of reasons, including my own heavy work schedule and my “woodie ignorance” I decided to have Tania professionally restored rather than trying to do it myself. I trailered the truck back east where it was disassembled, chemically stripped, refinished, repainted the original blue and reassembled. The spine was repaired but most of the rest of the structural wood was in excellent condition and was not replaced. The floor was heavily worn but not rotted. It was replaced using ash, which had been used for the original floor. The truck had many unusual accessories and the early pictures of the truck help to sort out their origin. In most fundamental respects, the truck was in amazingly original condition. It had never been “restored”. The engine bay, the interior, sheet metal, the under-carriage all looked like they had never been touched, and all the original parts were still there. I knew a missing siren had been added and removed by the Fire Chief of Yavapai. Some of the other special accessories were probably factory or dealer installed options but others were clearly not. For example, two of the old pictures showed that the truck was not fitted with a roof rack when delivered. A later picture of Don Moody with his father in 1953 shows the roof rack (since removed) was installed later. The original photos do show the spotlight, the heater and radio that are still with the truck. The front grill is now chromed, there is a 50s vintage clock mounted in the glove box door, it has an oversize steering wheel, there are twin mirrors, vintage turn signals and Warn lockout hubs, none of which were on the truck when it was delivered in St. Paul. As delivered to St. Paul in 1949, the Power Wagon was outfitted for work with a winch on front, a radio, and a spotlight. I had the opportunity to visit Waterloo, NY and speak with many of the old Campbell employees. None recalled any Power Wagon woodies but they made thousands of these bodies on many different cars and trucks. Vern Sessler had in his possession a large collection of photographs of the woodies that they had made. I was able to find pictures of a few other woodie Power Wagons but a close examination of these pictures revealed that none of them were mine. The employees said that when they had unusual applications, like the Power Wagons would have been, they were assembled from standard pieces that were modified on the fly to fit the specific vehicle. Since the modifications were not always identical, the trucks show minor differences. While passenger cars were sometimes modified to become woodies, trucks were often delivered to them as a chassis-cowl as this one was. This particular Power Wagon woodie, and all those that I saw pictures of in Waterloo, was based on the Surrey 11-passenger body. 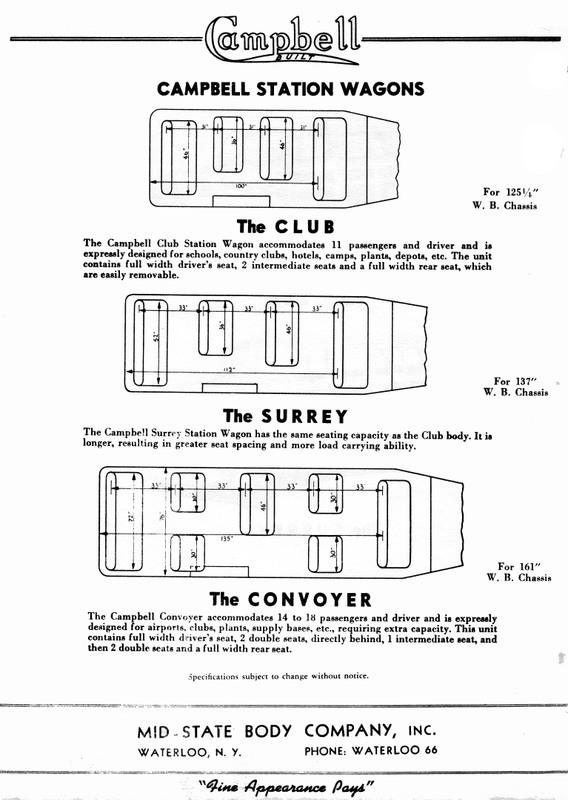 A page from the Campbell-Midstate Body Co. catalog sheet shows seating configurations offered. The 11-passenger Surrey body was adopted to the Power Wagon chassis. 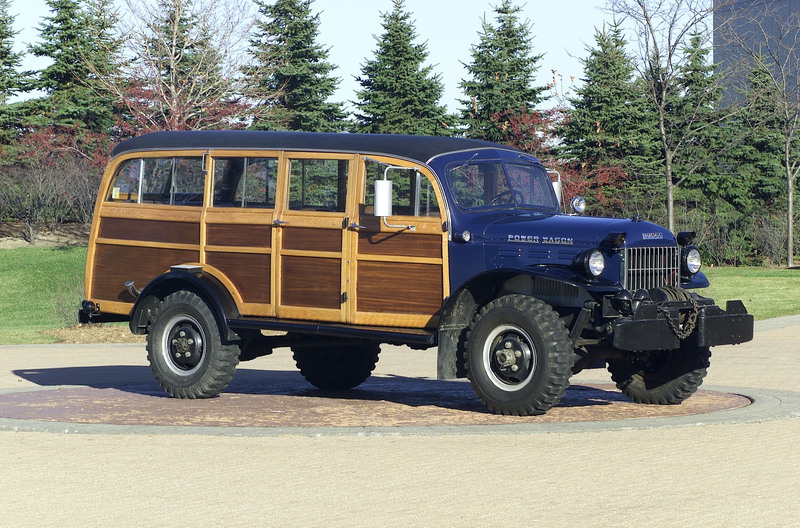 One of the woodie legends that came with the truck was that 50 Power Wagons woodies had been made and that 49 were shipped to the Middle East. Tania might have been the only one that remained in the US. While there is no way to document this now, I did find a picture of a woodie Power Wagon in the Middle East in a German book (“Auf dem Wege zur Schwarzen Oase”, Nikolaus Benjamin Richter, VEB F.A. Brockhause Verlag, Leipzig 1). It had double spare tires like some of the pictures in Sessler’s collection. So at least one truck did make it to the Middle East. 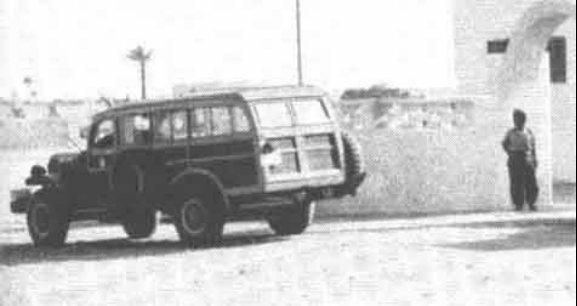 Power Wagon woodie in Libya from the book "Auf dem Wege zur Schwarzen Oase" or "On the way to the Black Oasis"
Today, this is the only Campbell-bodied Power Wagon known to exist. Cantrell also made a few woodie Power Wagons and two of those are known to exist. They have a shorter body with less overhang but like the Campbells, have two doors on the passenger side. There is also at least one example of a truck where a body from another truck was fitted to a Power Wagon. And of course there is the very professional and beautiful woodie fire truck done by Tom Philippbar in California. This woodie has worked hard and served its owners and users well. It certainly has been fun to own a vehicle that attracts so much attention. It continues now, at age 58, to bring pleasure to all who see it. Next month in Part 2 of this story, Don Moody will relate his fascinating experience with the Power Wagon in the 1950s when it was on the Ward ranch in Arizona. Don Moody got to visit the Power Wagon woodie again more than 50 years after his hunting adventures in it. Charles Ward, the original owner of the woodie Power Wagon, had become a wealthy man as President of Brown and Bigelow in St. Paul, MN. He had a farm nearby in Wisconsin and two ranches in Arizona. 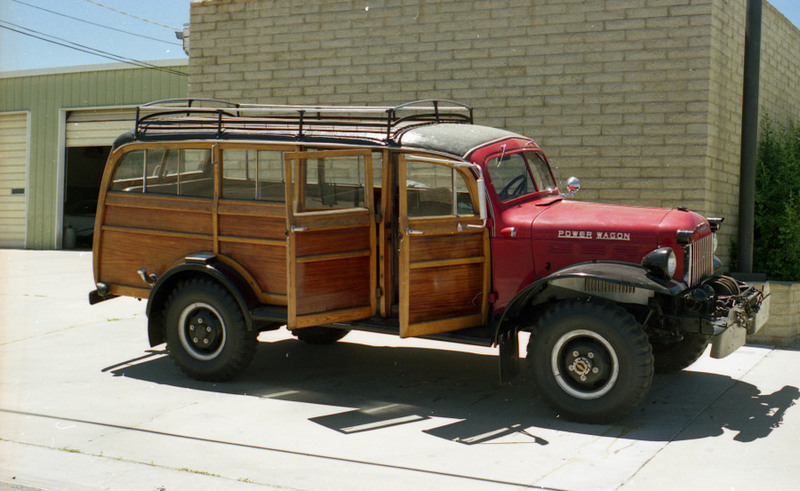 By 1951, the woodie was at Rancho Roca Roja, Ward’s large ranch near Cottonwood with only 7000 miles on the odometer. My dad was the foreman on this ranch. There, the truck was available for ranch guests and workers to use. As a child, I had many fond memories of the ole Power Wagon. I often wondered what happened to it; a few years ago I found out. In 2000 my wife, Kay, and I finally came "kicking and screaming" into the computer age with our new home computer. I knew very little about how to use it. However, I soon began to enjoy the wonders of the internet. I began to look up things that I was interested in to learn more about them. Well, one of the things from my youth that had retained my interest was the woodie Dodge Power Wagon. So, one day I typed in “Dodge Power Wagon”. When the site opened there were several categories. One of them was "Woodies", and I clicked on it. When it opened I was shocked! There was a colored picture of a Power Wagon woodie that looked just like the one that I remembered at the ranch in Arizona where I lived as a very young boy. I didn't think too much about it until I read the text that went with the picture. It stated that Mr. George Wellman had bought it in Arizona. That really set me to wondering what the odds would be that it was the same one that I knew so long ago. The text did not have any information as to how to contact Mr. Wellman, so I left a message on the Power Wagon Bulletin Board for Mr. Wellman asking if he might know something about his woodie, and asking him to contact me. In a day or so, George contacted me. When I asked him if his woodie had a brass plaque mounted on the dashboard with the name Charles A. Ward on it, he was as shocked as I had been when I saw the picture of the Ole Wagon. He said to me, "you do know something about my Power Wagon!" We had a wonderful conversation about the Ole Wagon and George invited me to come to see it sometime. I didn't, at the time, expect that would ever happen. George and I exchanged some pictures of the Ole Wagon and I kind of put it out of my mind. Then in 2003, some very good friends of Kay and I, from the Chicago area, invited us to spend Christmas with them at their cottage in Rhinelander, Wisconsin. We drove up from Texas and I started thinking about going to visit George in northern Michigan and the Ole Wagon on our way home. I called George to see if he would be home. He was excited that I was coming by and gave me directions to his place. When we got there, he had the Ole Wagon parked in the driveway. Needless to say, I was thrilled to see it and ride in it again. We had a wonderful visit with George and his wife. I took a bunch of pictures and I related a few of my stories about the Ole wagon. 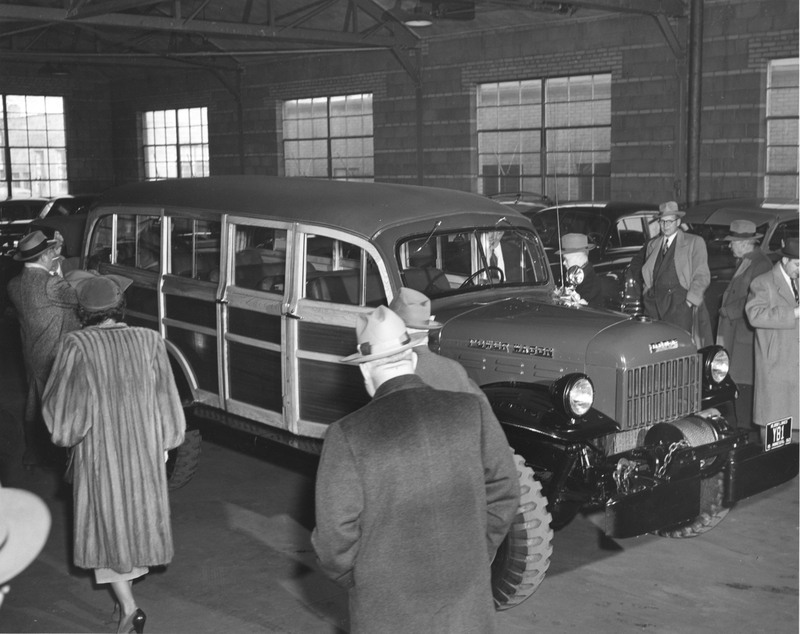 The woodie Power Wagon was a Christmas gift to Mr. Ward in 1949. I am not sure when it was sent to the ranch in Arizona. I asked my mother, who is 88 years old, if she knew and she was not sure either. But she said it was there in late 1951. The reason she knew this is because we made a trip in it back to Texas when my sister was 2 years old in the fall of 1951. Charles Ward tries out the controls of his new Christmas toy. My dad was the foreman on Mr. Ward’s horse ranch and Ward had sold couple of stallions to a friend in Texas. We were going to make the trip anyway, so dad decided to deliver the horses. The only vehicle that we had at the ranch at that time that was capable of pulling the loaded two-horse trailer that far was the Power Wagon woodie. Dad removed a couple of the rear seats so there would be room for my sister and me to play and sleep. As best I remember, it took about three days to go the 1000 miles back to Texas. At any rate, my mom said that the two stud horses fought all the way and Dad would have to stop every few miles and let them out of the trailer to cool them off and calm them down. Mom said the Power Wagon was not very smooth riding! In1952, Dad and his close friend, Bob Robinson of Cottonwood, drew elk tags for an area about 20 miles east of the ranch up on the Mogollon Plateau. They made a family affair of it and took the wives and kids. We stayed in the summer range cabin of a neighbor rancher. The Robinsons had son, Eddy, who was 4 or 5 years older than I. So, the 3 of them and the 4 of us loaded into the Power Wagon woodie and went to the mountains. The next morning dad and Bob left before daylight in the woodie. About mid-morning, we boys were driving our mothers crazy in the cabin, so they bundled us up and let us go out to play. It was very cold and there was ice on the stock ponds. We were drawn to the ice covered stock pond about 200 yards from the cabin. Of course we had to test the ice. It made a crackling sound, which scared me into not going out on it very far. However, Eddy was braver than I and he went out near the middle of the pond. Suddenly the ice broke and he went into the water. He as very lucky, as the water was not over his head. Needless to say, the moms were not happy. We had to stay in the cabin the rest of the day. The men didn’t return until after dark, but they had been successful. They had killed a bull elk. It was located in the bottom of Clear Creek Canyon, about 1000 feet below the rim of the canyon. They field dressed the elk, but did not have time to pack it out of the canyon before darkness closed in on them. So, they left it there until they could return in the morning. They were going to use the winch on the woodie to help pull the elk out of the canyon. Of course, the winch cable was not long enough. They found a roll of old telephone line in the barn at the cabin that was about 500 feet long. They also found a salt sled that the rancher used to pull salt blocks out to his cattle. We all loaded into the woodie for the trip to the canyon rim, about 6 or 8 miles away. When we got there, they gave the women a short course on to how to operate the winch. They then made their way down into the canyon to finish dressing out the elk. Eddy got to go with them but mother would not let me go. They pulled the cable out as far as it would go and tied the telephone line on the end, and then unrolled the wires as far down as it would go. Then they tied the salt sled on the end of the wire. It took them a long time to get down to where the elk lay. If it had not been for the red coats they were wearing, we could not have e seen them from the canyon rim as they worked on cutting the elk in quarters. It was mid-day before they got the quarters and the head up to the salt sled. Then the fun really began! With much hollering up at the women and much grinding of the gears of the woodie and the winch, they started the very slow ascent. The women had hell operating the winch. One stayed inside the woodie to operate the accelerator and the other operated the winch levers. They would finally get the cable rolled in, untied the wire, and have hell again unrolling the cable back down to its full length and tying the wire on again. This process of screaming and grinding of gears was repeated time and time again. Finally, Dad got to the top with the head of the elk. Then for the rest of the day, the same repetition was continued until the last of the elk was packed in the back of the woodie. It was after dark when Dad finally headed the woodie back in he direction of the cabin. There was no road, only cow trails to follow for much of the way, and in the dark everything looked different. I remember the woodie bouncing over very large boulders many times before Dad found the two-track road. That was quite a day for a 7-year old! Bob liked to pull jokes on people, so when he got back to Cottonwood, he went to the newspaper and had them print the story of the hunt and of the “wenches running a winch”! Mom and Bob’s wife were not amused. 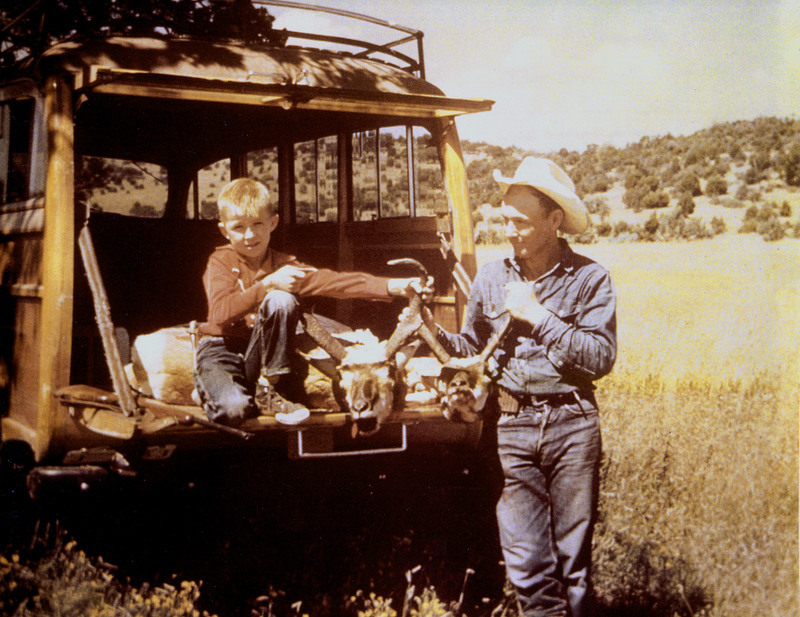 In 1953, Dad Bob and another close friend, Wes Roberts of Sedona Arizona, drew pronghorn antelope permits in the same general area where the elk hunt took place. On this hunt, Dad could only hunt for one day and then he had to be back at the ranch the next day. As the hunting area was only about 30 miles by road from the ranch, they decided to leave early in the morning of the opening day. Dad and I went in the woodie and Bob and Wes went in Wes’ new Jeepster Wagon. It was still dark when we got to the hunting area. As daybreak came, heavy dew formed on the grass. I was wearing a pair of black and white sneakers, so I quickly came wet to my waist. I was, as you can see in the picture, just a little guy. Anyway, the four of us walked across the open grassland toward a small hill that had timber cover. As we got near the hill, we saw three huge mule deer bucks go up and over the hill. They were still in velvet. Deer season had not opened yet. Soon after, a small herd of pronghorn passed between the hill and us. There was a nice buck in the herd, so Dad and Bob went after them. I stayed with Wes and we watched them stalk the herd. We heard a shot from Dad’s ole Springfield .30-06 and watched as the pronghorn raced away. Dad had taken the buck. It had 13-inch horns. After they field dressed the buck, Wes and I joined them for the long walk back to where the woodie and Jeep were parked. They drove the woodie as close as they could to the buck and loaded it in the back. Wes decided to hunt his way back to camp. As we were nearing the camp in the woodie we spotted two pronghorn standing by themselves about five or six hundred years away. One was very large buck. They were watching us, so we got out of the woodie. Dad waved his hat to keep their attention while Bob used what cover he could to help him get within range. The pronghorn kept watching us for what seemed like a very long time. Finally, we heard a shot from Bob’s Winchester Model 70 .257 Roberts. The pronghorn broke to run and we heard another shot. The buck went head over heels. He had huge horns. When we got to the buck, we found that Bob, who was an excellent shot, had hit it with both shots and you could cover the two bullet holes with one hand. Dad went back to the get the woodie, while I stayed with Bob while he field dressed the buck. When we got back to camp, they measured the horns. They were 18 inches! Bob then took pictures of Dad and me with the two bucks in the back of the woodie as you can see in the photo. Dad and I went back to the ranch that evening. Bob and Wes spent the night at the camp and Wes took a very nice 16-inch buck the next morning. It was so good to see the Ole Power Wagon woodie again, and to see it is in such great shape after all years and to know that, in George's hands, it would remain that way for the years to come. It was a real thrill for me to see and touch the Ole Girl again! It really brought back wonderful memories of my youth, of the Ole Wagon and the ranch in Arizona. George and I agree, the woodie Power Wagon made friends wherever it went and wherever it goes!